Quickly and permanently replace belts on live roller conveyors. POWERTWIST Roller Drive is a drop-in replacement for B/17 section V belts. 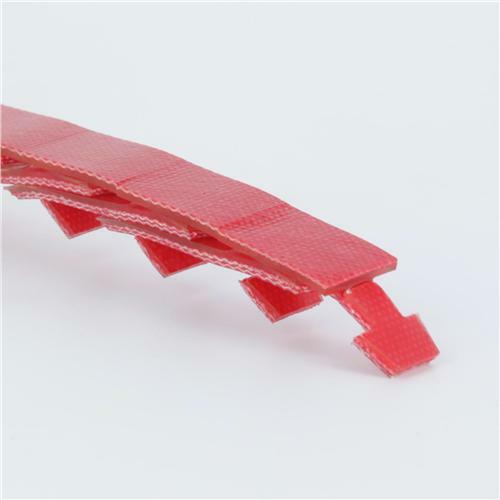 Easily installed without the need to dismantle the conveyor and proven to outlast and outperform rubber belts, especially on curves. Best Suited For: Belt driven live roller conveyors or Rapistan® Conveyor Systems that require 9/16” round profile belts. • Increased belt flexibility for longer life on curves! POWERTWIST Roller Drive is a specialty Power Twist belt which means it carries all the great benefits from POWERTWIST V-Belts! No tools required! No matter what equipment you are operating, productivity is critical. POWERTWIST Roller Drive helps minimize downtime with no tools required, easy installation in minutes without machine tear-downs or struggling with rusted-down motor bases. POWERTWIST Roller Drive can be made up to required length be hand in seconds and rolled onto the drive just like a bicycle chain. The custom multi-ply composite construction prevents roll-on damage. Tame hostile environments If your V belt drives are operating in hostile, nasty environments, you've got to take advantage of the high performance properties of polyurethanes. That's why we use a high performance polyurethane elastomer reinforced with multiple plies of polyester fabric for POWERTWIST Roller Drive. This custom material provides POWERTWIST Roller Drive with significantly superior resistance to oils, grease, water, and the most common industrial/agricultural chemicals and solvents. Plus an operating temperature range, with no loss of performance, of -40º F to +150º F. Conventional SBR/chloroprene brand V belts simply can't compete. If your drive environment is like hell's kitchen and conventional V-belt life is down to a few months, POWERTWIST Roller Drive may be your long term answer.